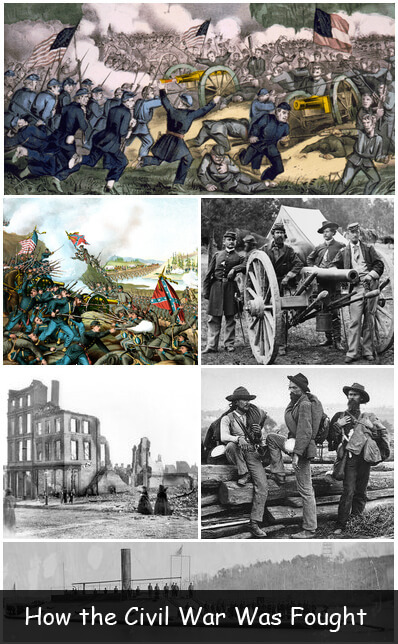 The Civil War killed more men than all other U.S. wars combined – over 600,000 soldiers. New technologies such as the telegram and railway made communication and the delivery of supplies and weapons more efficient. The weapons themselves were more powerful, more accurate, and more lethal. Although the Civil War was a “modern war,” soldiers still believed in gentleman’s warfare. Probably in part because they were fighting against their own countrymen, opposing troops often showed kindness to each other – delivering the letters of a dying soldier to his family or trading tobacco and coffee. In previous wars, soldiers marched in straight lines with muskets and bayonets, firing at the enemy when ordered. New weapons changed the slow, plodding pace of war. These weapons were faster to load and more accurate. General Lee’s troops built trenches to protect themselves. Trenches were used extensively in World War I and II. During the Revolutionary War, communication had to be delivered in person and was often delayed by days or weeks. The invention of the telegraph in 1840 meant that war communication was almost instant. Military leaders could instantly send messages about strategies or supplies. At least one-third to one-half of those who died in the Civil War died from disease and infection caused by poor medical care. Doctors hadn’t yet learned that disease was spread by germs. Injured soldiers were treated in field hospitals where doctors used dirty tools and needles. The camera was a new invention during the Civil War. For the first time, photographers and journalists followed troops. Newspapers published graphic battle stories and photographs. Telegraph: a machine that transmits messages along wires through signals. Question: What were slaves doing during the war? Answer: Abraham Lincoln issued the Emancipation Proclamation in January, 1863, which officially freed all slaves. Because the Southern states had seceded and no longer considered themselves under the authority of the U.S., Lincoln had no real power to free the slaves. However, after Lincoln’s proclamation, many free blacks, as well as runaway slaves enlisted in the Union army. Unfortunately, they were often discriminated against. They served in all-black units lead by white officers and were often paid less than white soldiers. Learn more about the Emancipation Proclamation and the role of black soldiers in the Civil War. Declan, Tobin. " Fun Civil War Facts for Kids ." American History for Kids, Apr 2019. Web. 22 Apr 2019. < https://www.americanhistoryforkids.com/civil-war-fought/ >.